October is National Indigenous Peoples Month. This annual observance serves as our reminder to celebrate diversity, to appreciate our cultural roots and, of course, to commemorate our country’s indigenous peoples. However, apart from this seemingly jovial commemoration, we should see this as an opportunity to know more about the plights of our indigenous communities. In spite of the existing Indigenous Peoples’ Rights Act law, the indigenous peoples remain to be among the most vulnerable and marginalized sectors of our society. They suffer from poverty, violence, discrimination, human rights violations and the lack of access to basic social services. That’s why it is clear that there is still a desperate need to empower indigenous communities by equipping them with knowledge about their rights so that they can make informed choices to improve their lives. 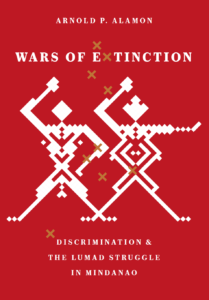 Arnold P. Alamon’s Wars of Extinction: Discrimination and the Lumad Struggle in Mindanao narrates the continuing struggle of the Lumad, the indigenous peoples of Mindanao, particularly concerning their ancestral domain, fending off development aggression and their fight towards self-determination. Alamon, who teaches sociology at the Mindanao State University-Iligan Institute of Technology, brings us to the front line of the plights of the indigenous communities. While the book focuses on the experiences of the Lumad, it essentially reflects the struggle of all the indigenous peoples in the Philippines. So if you want to further understand the precarious situation of the indigenous peoples, reading this book will be a good start. Here are five things you can take away from doing so. Some Filipinos, especially those in the north, often perceive Mindanao as an unstable region because of the presence of separatist movements and the constant threat of terrorism. As someone from Mindanao, I’m still occasionally asked, albeit humorously, if I eat bombs for breakfast by some of my “northern” friends. However, on a more positive side, Mindanao is also perceived as a melting pot of cultures where the Lumad, Muslim and Christian lives intertwine. The region also boasts abundance in natural resources. Different ethnolinguistic groups such as the Cebuano and Ilonggo now dominate some of the major cities and more recently, there has been a growing Ilocano population as well. For the longest time, Mindanao has been taking the backseat in our national lives. It is more considered as the marginal and peripheral region because of its distance from the so-called imperial Manila, where everything of national importance happens. But with the ascension to power by Rodrigo Duterte as the first Mindanaoan president, the region suddenly comes into the limelight again. The ironic contrasting notions about Mindanao, as embodied by “maganda talaga sa Mindanao” versus “hindi ba kayo nabobomba doon?,” only shows that there is indeed a need to revisit Mindanao. Alamon’s book recognizes the need to talk more about this issue in order to understand and appreciate Mindanao, its peoples and cultures, and to realize the region’s potential in our national lives. If we want to understand Mindanao, of course, we have to backtrack in time. History should not just be a forgettable thing of the past as it helps us make sense of our present. Why do some fear Mindanao? Why do some groups wage war? Why do Davaoeños speak Cebuano? A grade school history review: when the Spaniards relinquished its control of the Philippines to the Americans through the Treaty of Paris, they “inadvertently” included the southern island of Mindanao which actually was not completely colonized. The original inhabitants of the island were Muslims and various indigenous ethnic groups. The Sulu Sultanate was slowly creeping northward back then. In fact, if it weren’t for the timely arrival of Spanish conquistadors in the 16th century, the Philippines could have been an Islamic country. During the early 20th century, the National Resettlement Program dubbed Mindanao as the “land of promise” due to its abundance in natural resources, which in turn encouraged influx of migrants primarily from the Visayas. The sudden increase in population did not only create new settlements but also paved the way for the entry of various private enterprises. Ultimately, these factors prompted land encroachment, conversions of hectares of land to haciendas boosting Mindanao’s agricultural production. On the surface level, it seemed a good venture to increase Mindanao’s productivity capitalizing on the region’s abundance in resources. All good for national economy, right? Not exactly. It is unfortunate that the decades of logging and mining operations led to economic plunder and environmental disaster, not to mention the countless incidents of injustice suffered by the indigenous peoples as they were robbed and are still being robbed of their land. With the historical perspective, it becomes clearer that the root cause of conflict in Mindanao has always been the power struggle to control land. One of the most pressing concerns of the indigenous peoples is to protect their ancestral domains or “lupang ninuno” from development aggression and militarization, as by Alamon. Example: How would you feel if some strangers force their way into your house, asking you to leave because they want to get a hold of all your belongings? In this book, insights on how development aggression and militarization advance the private interests to extract and process resources for profit at the expense of the indigenous peoples. In turn, they suddenly become outsiders in their own land, and with their lands stolen from them, their livelihood and lives are also taken away from them. Dispossessing them of their ancestral domain, where their culture is rooted, where they live, do their livelihood and get their food, will cost them their lives and identity. For them, land is life and life is land. Aside from the issue of land grabbing, indigenous peoples lopsidedly lack opportunities in livelihood, employment, quality education and health care. Further, they are often wrongly stereotyped and sensationalized which, in turn, discriminate them from the society. Sometimes, some people only view them as mere selfie subjects especially if they’re being commodified for tourism. But outside of that, they remain to be socially invisible. They remain to be the “others.” They are still marginalized. Some of us still ascribe negative connotations on the “katutubo.” Discrimination still persists based on the indigenous peoples’ language, cultural background, economic capacity and appearance. These somehow detach them from the larger society and are some of the reasons of their marginalization. These can cause them to lose self-esteem and look down on their own identities. With that, it can contribute to the devaluation of indigenous customs as they are somehow forced to “leave” their identities to embrace a more dominant culture for social acceptance. These experiences drive them to become exiles from nationhood and force them into a fight for survival amid the wars of extinction. The wars of extinction or the militarization of indigenous communities is the state’s mechanism to railroad private interest into the resource-rich lands of Mindanao. These lands usually overlap with the ancestral domains of the indigenous peoples. The military and paramilitary elements harass, intimidate or even assassinate the Lumad, especially the opposing elders or leaders of the communities, to advance development projects. But the important question is: development for whom? The gradual eradication of the Lumad populace, dispossessing them of their land and identities, for the supposed economic gain will never be justifiable. No matter how economically favorable this “development” is, it will never be tantamount to the lives of whole communities and to the damage it will bring to the environment. In this tumultuous time in our country when the basic concepts of human dignity and rights are being questioned, we should constantly remind ourselves of the importance of human life. Every human life has dignity, an inviolable value that will never be taken away no matter who you are, and that dignity grants us our rights. You may ask: “What can I do? I’m just an ordinary Filipino. I also have my own problems and struggles. How can I fix the problem of indigenous communities if I can’t even fix my own life?” I know we don’t have supernatural powers to fix the problem instantly, especially if it’s deeply rooted in our history and culture. But as the cliché goes: a journey of a thousand miles begins with a single step. The first step is to know about the precarious situation of the indigenous peoples. Read and research. Be critical and familiar with their plights and struggles, and recognize the injustice they are suffering. We should make them part of our imagined community and not let them remain to be the “other.” Let’s do this not out of pity but because it is our responsibility not only as Filipinos but as human beings. Because to win the wars of extinction for the indigenous peoples, they have to have an effective means to express themselves that can enable them to gain confidence in their voices.